[background, optional read:] It was so stupid it makes me angry. I was flying indoors without prop guards (I wanted to measure flight time without them) and I was just spinning around very slowly. I moved forward and I stopped the throttle like a meter before a wall and the tello kept going (at 0°, on its own momentum like it does in slow mode)! but I noticed it was getting close to the wall so I rolled back and it slightly tilted (no idea why it did that) so it wasn't enough (I was using TelloFPV but I doubt it was the culprit). It hit the wall going extremely slow and then one motor died :/ It feels loose, like the brushes broke or something. Will these motors work? Can I use *any* motors as long as they match the dimensions? It would be interesting to know as I just got "Larry" (white, like a Bird, homage Celtics #33) back from Ryze service. One of my motors died 2 weeks after I got it. They accepted it as a warranty claim and through correspondence assessed and claimed to repair it. After I received it back, I realized they replaced it but failed to mention it. I contacted CS and they "explained" that according to them they are not replaceable. Sure it's a little work but I see it can be done. I have also heard that be sure to replace them in pairs ad new motor old motor may have issue working together. Yeah I saw that and saw a bunch of videos of people replacing motors. They helped me, but I can't buy those parts. 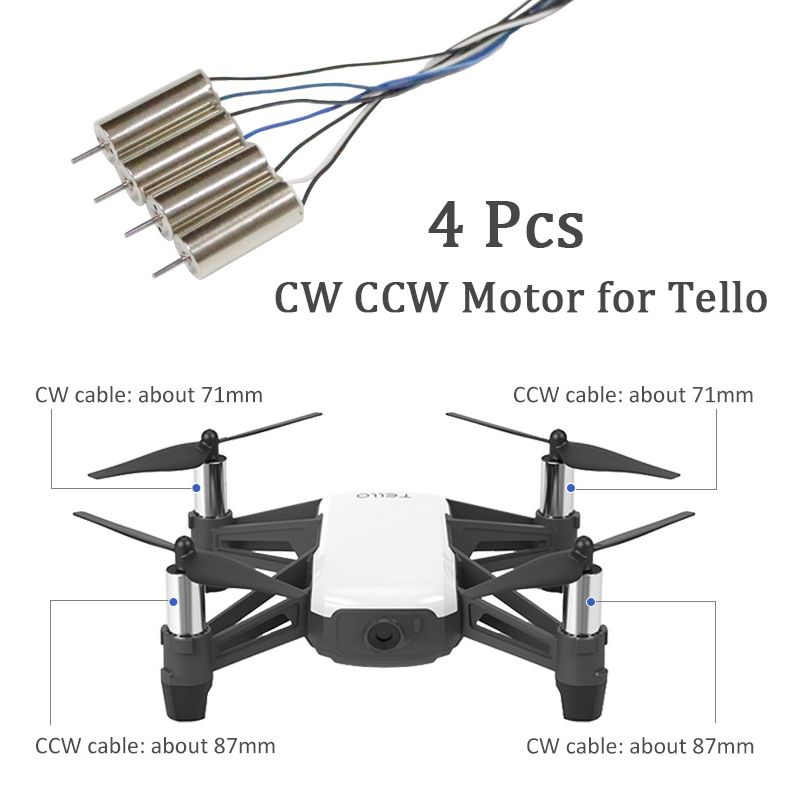 Chinese generic motors seem to work, but they are sold specifically for the Tello. My question is will even more generic motors work? What are the specs of the motors? Basically if they meet the Kv requirement, then they should work. The Tello OEM motors are 14.000Kv . Note: Getting higher Kv does not mean they will go faster. The ESC will control the speed of the motors. I just replaced mine w/ non OEM from Amazon $14.00 for all 4 free shipping. I replaced the bad one and took it for a test flight. Seemed to fly ok but I didn't test very much before replacing the other 3. I will use the old ones as back-ups. Thanks! Do you have a link of what you bought? That's actually a good tip, thanks a lot. Where exacly are you from and why can't you use Amazon, eBay, etc? That's a tough situation. Maybe you have a friend somewhere in a country that can order for you. I wish you luck.. Try this one. If you get AliExpress, you should be able to get from these guys. I order from them all the time. They take around 30 days to deliver. Hello all! I had a little crash with my Tello. One more seems to be not running in the middle anymore... Is it difficult to replace it? ( It still does fly nice but don't trust it) and did anybody used the motors of the link which Ansia provided before? Thank you for your help..
Hit a wall, killed a motor. How to replace!